Known as the Garden City because of its greenery, Al Ain (“The Spring” in Arabic) is located about 100 miles east of Abu Dhabi, near the border with Oman. It is set between the desert and the mountains that provide water for its ancient system of wells. When I first came upon it, I was riding in the local bus from Abu Dhabi and it looked like I could have just entered Marco Island in Florida. There’s plenty of traffic and the wide boulevards are lined with stately palm trees. Flowers bloom everywhere and, while it’s February and very cold and snowy back home in New England, here it’s a temperate seventy-five degrees. There’s no doubt though that this is a Middle Eastern city. Storefronts are identified in Arabic and English, and men in long white dishdashas and keffiyehs and women in black abayas stroll the streets. I hear the “call to prayer” from the three nearby mosques five time a day, and dates and Arabic coffee are served as I enter the hotel. The entire city of Al Ain has been designated a UNESCO World Heritage site because of its many historical buildings and monuments and its seven oases. Take three or four days to fully enjoy the culture and sights of this interesting place. Sheikh Zayed bin Sultan Al Nahyan, the late founder and President of the seven Emirates, lived here as a boy. 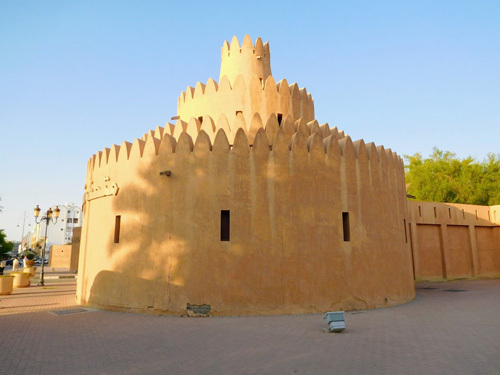 Now a museum, the Al Ain Palace Museum, it was built in 1937 and is a lovely and serene property consisting of low two-story mud and stucco buildings built around several courtyards in the city’s traditional architectural style. It’s easy to visualize how the Sheikh and the ruling family lived here. The old Land Rover used to tour the region and visit its citizens sits in palm-frond shade at the entrance, and rope swings hanging from the trees are reminiscent of childhood days. 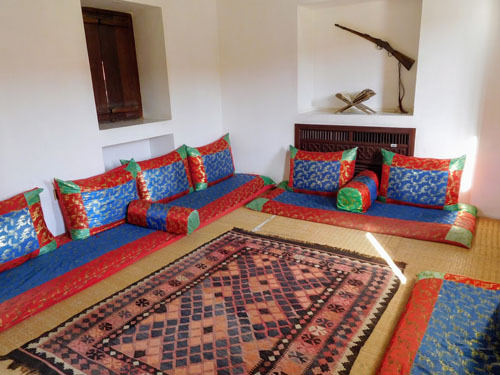 The reception rooms, bedrooms, “Systematic” school room, Holy Koran study room, meeting rooms used to greet guests and visitors to the palace, and the tent used to host local and international dignitaries in true Bedouin style are open to visitors. As in America’s White House, there’s a “blue room” and a “red room”. But here, instead of period furnishings, you will find low banquettes upholstered in hand-woven Bedouin designs and a coffee service and food cover in the center of each of the public rooms. Artifacts from the Sheikh’s days with his beloved falcons and family photos and paintings line the walls. The administration building has exhibitions and a family tree that traces the ancestry of the Al Nahyan family, rulers of Abu Dhabi. Families were very large because Islam permits polygamy, and it was considered a father’s duty to have many children and increase the tribe’s population. 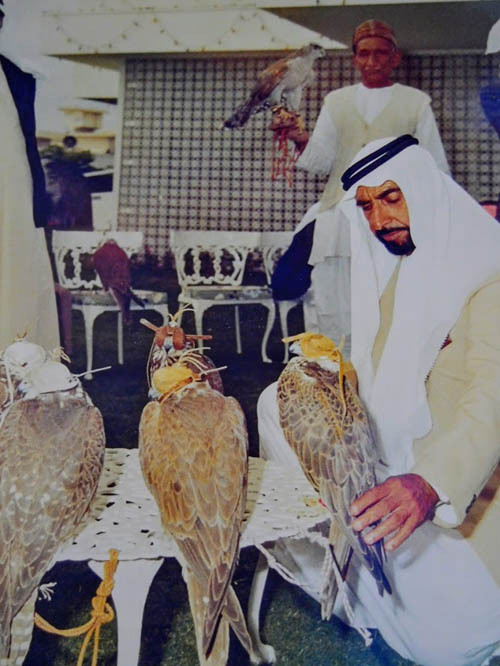 Sheikh Zayed set a good example by siring thirty children. All twenty-one of his sons are identified on the tree, but none of his undisclosed number of daughters are shown. The Al Ain Oasis, a UNESCO World Heritage Site, consists of palm plantations, many of which are working farms, on nearly 3,000 acres in the center of town. More than 147,000 date palms of 100 different varieties and some fruit-bearing trees grow here. 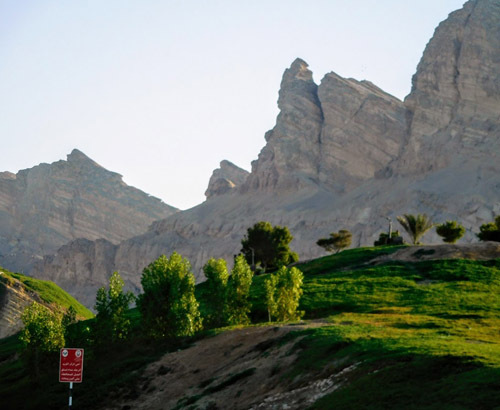 It has been cultivated for several thousand years using miles of aflaj (singular: falaj), an ingenious network of water channels that tap into underground wells and provide irrigation to the oasis in this arid climate. The falaj system was considered leading-edge technology at the time it was developed, and it still works well today. At the entrance to the oasis, there’s an information kiosk, an eco center that provides curated and interactive exhibits, a miniature oasis that mimics the real oasis, a palm display, and a falaj exhibition. Inside the oasis are miles of wide narrated walkways and bicycle paths for exploring the gardens and palms and viewing the aflaj in operation. On a sunny weekday morning, this is a very peaceful place where all you can hear is birdsong and the call to prayer from the tiny mosque in the oasis echoed by nearby mosques in the surrounding city. At the border of the oasis is the Al Ain Palace Museum to the west and the Al Ain National Museum to the east. The pathways in the oasis provide a cool and quiet sanctuary in the heart of the busy city and are good routes to access these popular tourist sites. 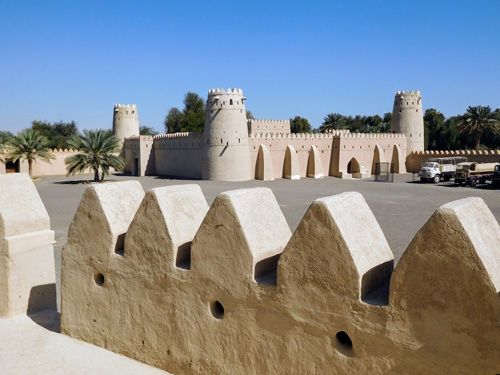 Picturesque Al Jahili Fort was built in 1891 to protect the palm groves and mountain passes. It also served as a summer residence for the royals because of the city’s moderate climate. The iconic main tower with its stepped tiers looks like a wedding cake and provides a perspective view of the entire property. 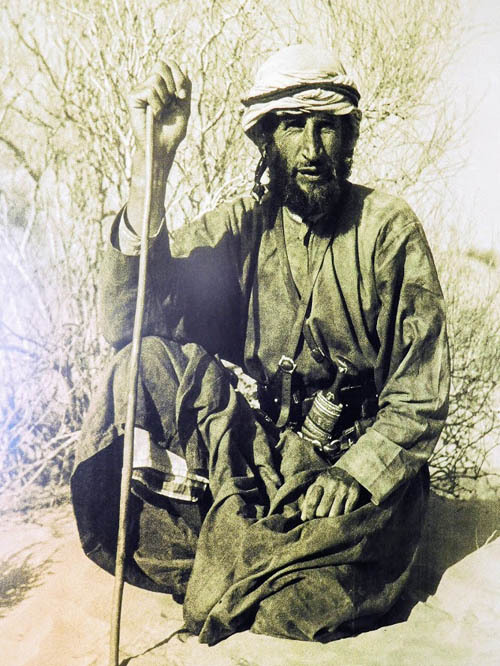 The welcome center has a photo exhibition by British explorer Wilfred Thesiger who crossed the Empty Quarter with a Bedouin camel caravan in the mid-1940’s and recorded what he saw with his camera. Be sure to watch the documentary film prior to viewing the exhibit. This was an amazing and heart-warming feat for the adventurer as he battled the difficult terrain and made life-long friends with his Bedouin guides. There also are books and Bedouin handicrafts for sale. In the room adjacent to the reception, you can watch traditional palm weaving being crafted by a woman wearing a metal mask and a long black abaya. I found her sitting low to the floor, drinking coffee and making food covers and small baskets. Her hands were adorned up to the elbows with intricate henna designs, a symbol of female beauty and sensuality. The Camel Souq is a working market that sits in an area near the Bawadi Mall south of town just beyond the sheep and goat markets. 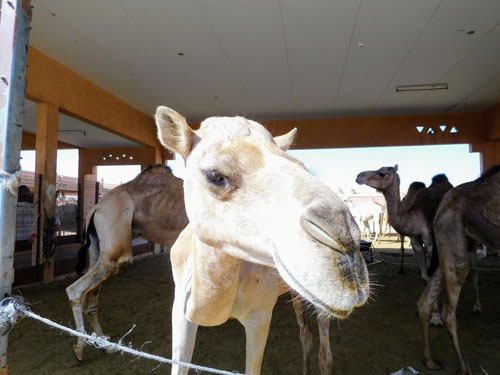 This is where you can find a racing camel for $30,000 or a baby with good genetics as there are hundreds of camels of different color, size and breed to choose from. Watch the traders discussing the merits of their prize camels, but don’t get in the way. Serious business is conducted here. Although the market opens daily at 6:00 am, I visited in the late morning. At that hour I was the only “customer” and almost as prized as the camels themselves. One man offered to show me some babies, and within five minutes, I had six smiling “guides” walking with me, talking excitedly in broken English, taking my photo, telling me the camels won’t bite, and introducing me to their fellow traders. I spent twenty minutes enjoying their company and this unique place, then tipped them generously and went back to my waiting taxi. The Al Ain National Museum is the oldest museum in the UAE. It was built by Sheikh Zayed bin Sultan Al Nahyan and inaugurated in 1971. I walked from the Palace Museum through the Oasis to get there. Its collection of artifacts from archaeological digs around Al Ain and other parts of the emirates enables you to trace the history of settlements in this area from the Stone Age to the foundation of the UAE. It’s a small museum with two main sections, one about the people and culture of the region and another exhibiting finds from archaeological digs. 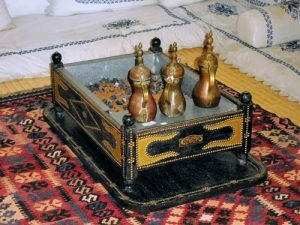 Displays include dioramas of Bedouin society, exquisite jewelry dating from 4,000 years ago, Bronze Age weapons, and 5,000-year-old vessels excavated from tombs on Jebel Hafeet, the mountain that lies south of Al Ain. There’s also an interesting display of gifts to UAE rulers presented by presidents and dignitaries from around the world. One of these, a piece of rock from the moon obtained during the historic Apollo 17 mission, was presented by the National Aeronautics and Space Administration in the USA. Jebel Hafeet, or Mountain Hafeet, is a marvel of nature that is accessed by a road that winds twelve miles up the mountain and is considered to be “among the world’s greatest driving roads” by the automotive resource, edmunds.com. 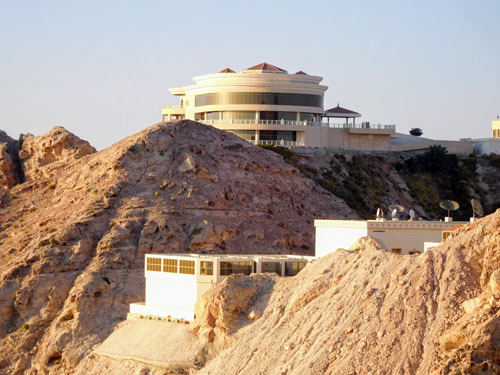 It rises 4,100 feet above sea level and lies south of the Al Ain border shared with Oman. Abu Dhabi’s highest peak, Jebel Hafeet is created out of craggy limestone that has been weathered for millions of years. In the foothills of the mountain, over 500 burial tombs have been discovered that date from the beginning of the Bronze Age in the Emirates. Artifacts from these tombs can be seen in the Al Ain National Museum. Along the way to the top is Green Mubazzarah park near the base, a luxury hotel near the top, and spectacular views of Oman and Al Ain. Plan your trip for the latter part of the afternoon so that you can see the awesome sunset. Coming back to my room in the hotel, I sat on the balcony and could see the mountain road lit up in the distance. About the author: Elizabeth von Pier is a retired banker and an avid traveler, photographer and writer. She has been published in the Los Angeles Times, In the Know Traveler, Go Nomad, WAVE Journey, Travelmag—The Independent Spirit, and Travel Thru History, and recently published her first book, “Where to Find Peace and Quiet in London.” Ms. von Pier lives in Hingham, Massachusetts.